Red Barrels Games both surprised and shocked gamers alike with the original Outlast released back in 2013. Now, the independent Canadian games studio is looking to elevate heartbeats to new levels with the upcoming Outlast 2, set to launch in Q3 for Playstation 4, Xbox One and PC. Eschewing the psychiatric hospital setting of the first game, Outlast 2 sets players into a number of different varying locations. For the E3 2016 demonstration, I took up the role of Blake Langermann, a camera man who’s searching for his wife Lynn and a way to escape the hellish landscape. The experience is played through a first person perspective with few on-screen HUD elements to avoid distracting players from the visuals, save for some cues when being hunted or objects that are highlighted to demonstrate what can be picked up, such as batteries. Much like the first title, using the camera is the only way to see clearly through the darkness. Being out on the E3 show floor with lots of flashy lights all around coupled with the heavy blacks used in shadows and environments made it nearly impossible to navigate without using Blake’s camera. His camera, much like the protagonist of the first title, can be raised and lowered at any time and can be toggled on with a night vision filter. This night vision effect however puts a heavy drain on the batteries, draining an entire battery in only a few minutes. At numerous points throughout the demo, I had to lower the camera and run blindly towards the nearest light source just to conserve precious battery life. Extra batteries were incredibly scarce during my twenty minute session and there was an uncomfortably long stretch midway through where I was without any power. Thankfully, this was during the school setting that marked the halfway point of the demo with enough overhead lamps to make it through without that crutch. The demo began with Blake at the entrance to an abandoned settlement on the hunt for his wife Lynn and another unknown female individual. Right from the start, the performance was quite smooth and solid. Blake’s camera was marked as recording video at 1080P/60FPS, surely a nod at their targeted specs for launch. The way forward was usually indicated by some form of environmental cues, whether it was a door slamming shut just out of view or the sounds of footsteps racing away off in the distance. The directional audio gave a rough side of where the sounds were coming from, but it was difficult to pinpoint the exact direction. Another spec on Blake’s camera was an audio level that showed the level of noise to either side. Spinning the camera around and using those volume bars on his camera were more precise than trying to listen through the headphones I was given. Establishing a setting where the sense of dread and gloom feels natural is one of the most important facets for setting up the type of horror that keeps you on edge for the next scare. Nowhere in the demo did this small Arizona village feel too pristine or new; everything had an organic feeling that felt used and worn, even in spots that weren’t littered with creepy dolls or eviscerated animal organs. The transitions between the various locations felt somewhat disconnected, especially the set piece moment when Blake falls down into a well and lands into a confined crawl space. 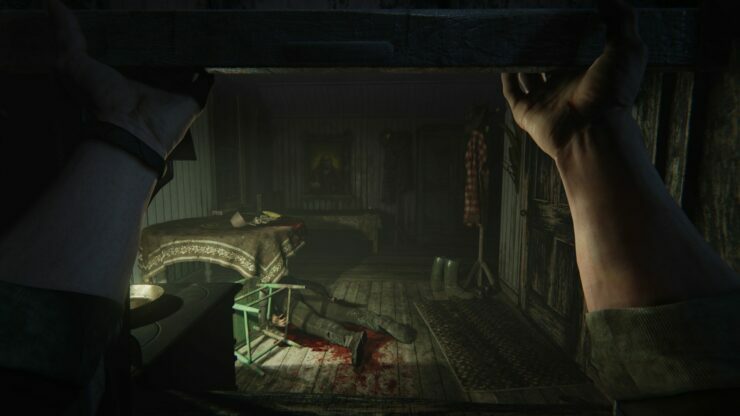 First-person crawling sections can be one of my pet peeves in stealth sections and Outlast 2 reconfirmed that bias with a confusing section of crawling around with a proper lack of direction only to have the ground fall out from under the character and land into an abandoned school room. If there was some sort of symbolism to that transition, it was surely lost in the moment. The final moments of this Outlast 2 demo took part in a cornfield, littered with enemy AI that wandered around in patterns I couldn’t just memorize and try to sneak around. No, this scene was supposed to be filled with tension and the fear of hiding down in the rows of corn only to scamper off with my figurative tail between my legs. In reality, I was stuck without any batteries to run the camera’s night vision mode so I was stuck running forward into pure blackness; the only light source to guide my way were the flashlights that these unknown assailants carried. In more than one instance, I crossed paths with a cautionary villager and was attacked before I could sprint away yet never outright killed. With Blake’s low stamina, I was only able to run a few yards away before he would have to catch his breath. Originally, I was thankful that there was a water barrel nearby that I could hide inside, but it didn’t seem to do much to save my hide. The enemy that was following me wandered up to the barrel and stood around it for at least a solid minute or two. Eventually I grew bored of hiding and tried to leave my hiding space only to be attacked by the villager that didn’t leave my side and hacked my character to pieces. From then, I had to restart the cornfield moment all over again, once more without any batteries or better understanding of where to go. 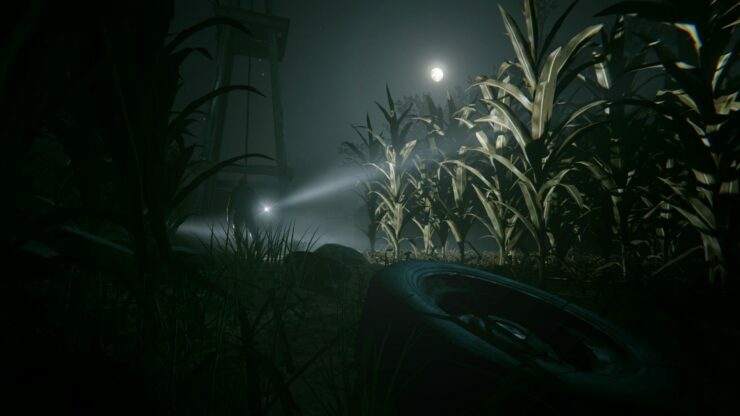 My last run through the cornfield was merely finding a fence along the right side in complete darkness and following along it until I could scramble over and meet my untimely demise at the hands of a pickaxe wielding psycho. I left the demo thinking that there might have been some interesting, suspenseful moments in that cornfield that I missed just because of not having another battery to see what was going on. Outlast 2 had a few moments that brought my heart rate up and kept it going with the suspense they were building. Sadly, the moments that required the player to give up reason and follow their instincts to run away felt unrefined compared to the anxious exploration. There’s the groundwork for something truly horrifying to be uncovered in that abandoned village, but there’s some refining that needs to take place before I’m ready to return. Next time, I’ll be sure to pack some extra batteries. We’ll have an interview with the developers up shortly. Stay tuned.